Bogan Teaser Release: The Official Twitter account of Jayam Ravi and the official Bogan Movie Twitter account announced the Bogan first teaser release date and time initially on November 1, 2016. Jayam Ravi and Arvind Swami starrer Bogan will be released today on Friday, November 4. The Bogan Teaser will be ready to rock the Social media from 5 PM. The Official Bogan Teaser will be released on YouTube directly. Watch Bogan Teaser here below. The Bogan Movie First Look Poster was released on June 9th by Hansika on her Twitter account. Now, the film going to hit the silver screen on the Christmas occasion of 2016. So, the Teaser, Songs, and Trailer will be ready to surprise the Tamil Movie Fans and Jayam Ravi – Arvind Swami fans. The Bogan Teaser had the run time of 1 minute 4 seconds awesome video clip. The teaser will be released either on Sony Music India YouTube channel nor Prabhudeva’s new Channel. The reunion of Jayam Ravi and Arvind Swami has already created an expectation over the cinema lovers after the superhit of Thani Oruvan. The Bogan movie has written and directed by Romeo Juliet fame Lakshman. Jayam Ravi and Hansika are the lead pairs again on screen after Romeo Juliet. Akshara Gowda, Nagendra Prasad, Varun and others are supporting artists of this film. D Imman is the music director for this film, Soundararajan is the cinematographer, and the Antony is the editor of Bogan. People says that the Jayam Ravi’s Bogan is inspired by the John Woo’s Hollywood movie called Face/Off. It is a science-fiction film cast by John Travolta and Nicolas Cage. The movie makers said that the Bogan story has modified based on Tamil audience. 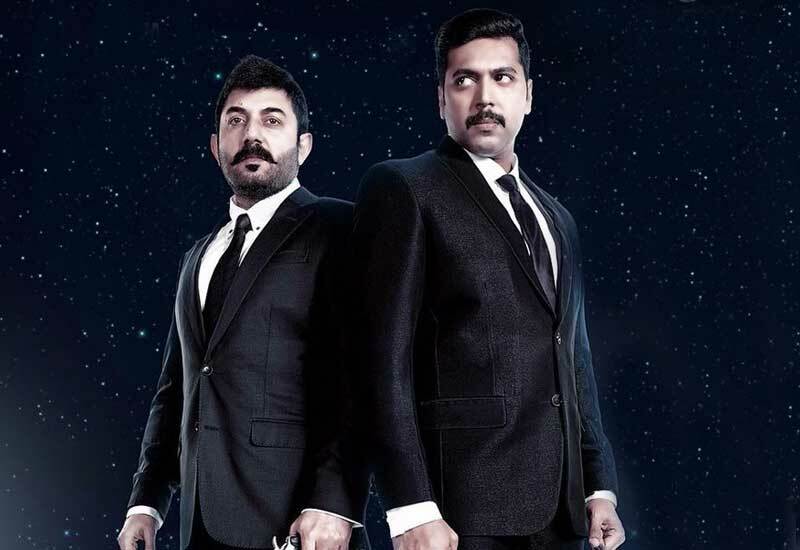 Arvind Swami tweeted recently about his competition on Bogan shooting as “Just finished my last shot for Bogan. Planning to take a break for a few days, travel. Enjoy the teaser when it comes out. C u all later!” So, the remaining shooting portions are expected to conclude in upcoming weeks.